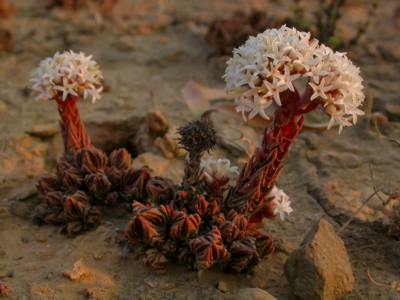 A unique and intriguing dwarf succulent from the Crassula family with the curious ability to cover itself in sand. Crassula alpestris is a short-lived dwarf perennial succulent that forms a dense clump of stems 50-150 mm high and spreading to a similar size. The numerous succulent stems branch only from the base of the plant and are fed by a short taproot with a dense mesh of wiry adventitious roots. The succulent leaves are triangular, 10 mm wide at the base, 5-8 mm long and taper to a sharp point, and tightly clasp the stem and the leaves above. As in many Crassula species, the leaves are arranged oppositely with each leaf pair at 90 degrees to the pair above and below, resulting in a curious 4-ranked square-stemmed appearance. The flowers are white, sometimes tinged with pink or red, and clustered into a dense thyrse ( a branched inflorescence in which the main axis continues to grow but the growth of the side branches is terminated by a bud or flower) always at the tips of only the most mature stems. Each flower is tubular with petals fused at the base and flaring at the mouth. Flowers are fragrant in the evening. Flowering time is between July and September in the southern hemisphere. The fruits are small capsules which release dust-like black seeds which are wind-dispersed. Crassula alpestris is fairly slow-growing relative to other Crassula species and can take a few years to form a sizeable plant and flower. In the wild they will presumably live for up to 3 to 5 years or perhaps even longer. In cultivation, under good conditions, the plants can last somewhat longer. This species is not currently recognized as being threatened as it fortunately has a relatively wide distribution, usually in arid areas not suitable for agriculture. 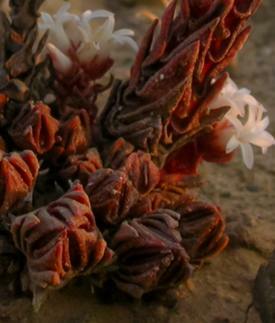 Crassula alpestris is an exceptionally well drought-adapted member of the genus and is usually to be found growing in small groups out in the open in shallow sand/grit pockets on rocky outcrops where it is protected from bushfires. Its natural distribution is in the winter-rainfall parts of South Africa in the Western and Northern Cape Provinces. 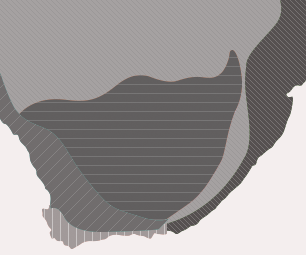 More specifically it extends from the southern parts of the Tanqua (Ceres) Karoo to southern Namaqualand and most prominently in the sandstones of the Cedarberg and Koue Bokkeveld Mountains. The specific epithet alpestris refers to its preference for mountainous habitats. It was described as long ago as 1778 by Carl Peter Thunberg, a Swedish doctor and naturalist, often referred to as the father of South African botany. This species is unique amongst crassulas in that it possesses the curious ability to allow sand grains to adhere to the back of its leaf surfaces, resulting in the plant being coated in a layer of silica armour. This, presumably, not only makes the plant less palatable to predators, it also affords some degree of camouflage and acts as a sunscreen for the plant during the baking-hot and dry Mediterranean-type summers. Because of the high altitude, shallow soils and rocky habitats of this plant, it can tolerate remarkable temperature extremes. In summer, soil temperatures could reach as much as 50°C, if not higher, and in winter these plants regularly get covered in snow with temperatures dropping to around -5°C. Not much is known about the pollination of this species but the pale cream flowers and fragrance would indicate that it is probably nocturnally pollinated by moths. Crassulas are amongst the easiest succulents to cultivate. This species, however, proves to be marginally more difficult than others. The secret for success is very well-drained, gritty, essentially mineral soils with a low organic content, excellent ventilation and very bright light. Being a dwarf novelty plant it is recommended to cultivate this species in a clay pot rather than the open soil. A sunny windowsill should therefore work well but to keep the plant naturally compact and neat, growing it outdoors in the full sun is recommended. Its ability to tolerate temperature extremes makes it well suited to outdoor cultivation. Water very sparingly and only when the plant becomes soft to the touch. As they are so drought-adapted, their watering requirements are very minimal. Overwatering is the easiest way to kill these plants, as they are susceptible to fungal attacks which result in rotting. Feeding is not necessary and will only cause lush growth which will ruin the refined nature of the plant. At flowering time, one or two of the most mature stems will elongate and terminate in an attractive creamy white inflorescence. This stem will then die after the seed has set. To keep the plant healthy, remove these dead stems at the base. Propagation is easy from cuttings, at any time of the year, which means they can be bulked up very easily. Submerge the lower half of the stem in a dry gritty medium. Do not water the plants at this stage but rather keep them dry. Keep the pot in a bright situation out of direct sunlight where they will not get any water. After a week, they could receive a light sprinkling of water. Rooting should start to take place within 2 weeks. Once the cuttings have visibly greened up, move them to a sunny spot, and before long young plantlets will develop around the base. Seed should be sown in autumn. Mix the dust-like seed with a small quantity of fine sand. Spread the sand evenly over the surface of the soil. Water immediately, preferably from below by standing the pot in a tray of water every few days. Keep the soil moist like this for the first month or so. Before long, tiny green plantlets should appear on the soil surface. Start to let the soil dry out between waterings. Soon the plants will bulk up, and if one achieves the ideal growing conditions, one can raise many thousands of plants like this. The use of a damping-off fungicide is advisable. Rowley, G. 2003. Crassula. A grower's guide . Cactus & Co. Libri. Tölken, H.R. 1985. Crassulaceae. Flora of southern Africa 14. Botanical Research Institute, Pretoria.